"The $41.88 billion budget deal that was filed Wednesday morning and quickly approved by the Legislature includes no new fees, according to the lead House negotiator, and relies on an unusual eleventh hour revenue projection upgrade to boost spending to levels higher than either the House or Senate approved this spring. The budget (H 4800), which is on track to reach Gov. Charlie Baker’s desk by the end of the day, was filed 17 days after the start of the new fiscal year, and 13 days before the end of formal legislative sessions, during which recorded votes can be taken. "Yesterday, the Budget Conference Committee released its FY19 report and it was enacted by the House and Senate. I am pleased to say that all of the local amendments for Franklin were funded fully and included in this report. $50,000 for an Accessible Van for Tri-County"
The budget now is in the Governor's approval queue. He has ten days to approve or reject a specific line item. This also leaves some time for the House and Senate to take action on override items before their session closes for the Summer. 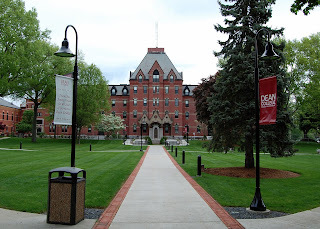 "Now in its second year, Dean College’s Pre-College Summer Forensic Program is nearing its end, but will be back again next summer. The program lasts two weeks, costs running from $1,250 for commuters and $1,950 for students who choose to catch an early college dorm experience and remain on campus. With so many crime dramas saturating cable and streaming services, it’s hard not to take an interest in the investigative process, according to Dean Paul Resten.